Twitter has been sharing pictures of Joey from F.R.I.E.N.D.S. and comparing it to the Balenciaga coat. Back in May, Balenciaga came under the radar of online trolls for their shirt-T-shirt combination worth $1,290 (approximately Rs. 87,000). Now, the luxury fashion house has again found itself on the receiving end of jokes – most of which are of the same kind – over their “Layered Oversized Parka”. For the lack of a better description, the coat is made up of various colourful layers of different materials and is meant to be worn in chilly weather conditions. The coat, priced at $9,000 (approximately Rs. 6.3 lakhs) on Barneys, has Twitter making the same joke about it. 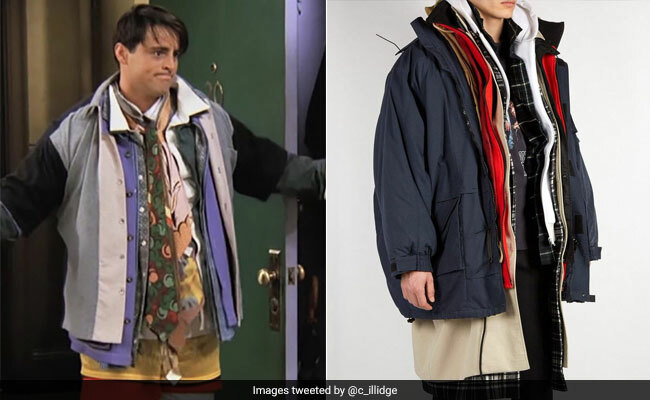 Several people on Twitter have been posting pictures or tweeting about how the coat reminds them of a certain scene in popular sitcom F.R.I.E.N.D.S. Do you remember ‘The One Where No One’s Ready’ episode from Season 3? There’s a scene in which Joey (Matt LeBlanc) shows up wearing everything Chandler (Matthew Perry) owns.